Origins of the Etruscans: Was Herodotus Right? Geneticists in 2007 were able to add an edge to a 2,500 year-old debate over the origin of the Etruscans, a people whose brilliant and mysterious civilisation dominated north-western Italy for several centuries until the rise of the Roman republic eclipsed them. Several new findings in 2007 supported a view that had been held by the ancient Greek historian, Herodotus - but one which remained unpopular amongst archaeologists - that the Etruscans originally migrated to Italy from the Near East. Although Roman historians played down their debt to the Etruscans, Etruscan culture permeated Roman art, architecture, and religion. The Etruscans were master metallurgists and skilful seafarers who for a time dominated much of the Mediterranean. They enjoyed unusually free social relations, much remarked upon by the historians of other ancient cultures. 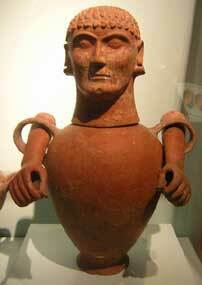 Etruscan culture was very advanced and very different from other Italian cultures of the time. But most archaeologists have seen a thorough continuity between a local Italian culture known as the Villanovan which first emerged around 900 BC and the Etruscan culture, which began around 800 BC. 'The overwhelming proportion of archaeologists would regard the evidence for the eastern origins of the Etruscans as negligible,' said Anthony Tuck, an archaeologist at the University of Massachusetts. Even so, a nagging question remained: could the Etruscans have arrived from somewhere else in the Mediterranean world? 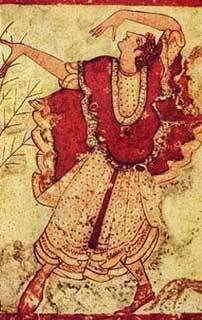 One hint of such an origin is that the Etruscan language, which survives in thousands of inscriptions, appears not to be Indo-European, the language family that started to sweep across Europe sometime after 3000 BC, developing into Latin, English and many other tongues. Another hint is the occurrence of inscriptions in a language on Lemnos, a Greek island, that is apparently related to Etruscan. But whether Lemnian is the parent language of Etruscan, or the other way around, is not yet clear, according to Rex Wallace, an expert on Etruscan linguistics at the University of Massachusetts. An even more specific link to the Near East is a short statement by Herodotus that the Etruscans emigrated from Lydia, a region on the eastern coast of ancient Turkey. After an eighteen-year famine in Lydia, Herodotus reports, the king dispatched half the population to look for a better life elsewhere. Under the leadership of his son, Tyrrhenus, the emigrating Lydians built ships, loaded all the stores they needed, and sailed from Smyrna (now the Turkish port of Izmir), reaching Umbria in Italy. Despite the specific nature of Herodotus' account, archaeologists have long been sceptical of it. There are also fanciful elements in Herodotus's story, like the Lydians being the inventors of games such as dice because they needed distractions to take their minds off the famine. And Lydian, unlike Etruscan, is definitely an Indo-European language. Other ancient historians entered the debate. 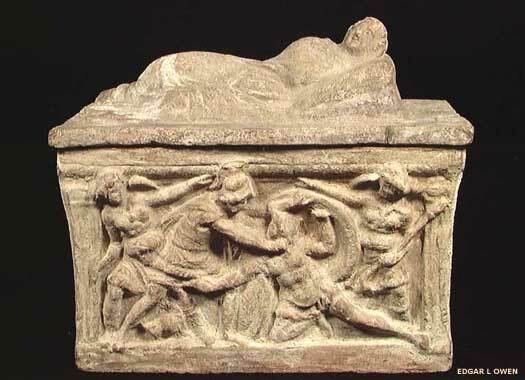 Thucydides favoured a Near Eastern provenance, but Dionysius of Halicarnassus declared the Etruscans native to Italy. What in the twenty-first century AD brought Italian geneticists into the discussion were new abilities to sequence DNA and trace people's origins. In 2004, a team led by Guido Barbujani at the University of Ferrara extracted mitochondrial DNA from thirty individuals who had been buried in Etruscan sites throughout Italy. This study quickly came under attack. Working with ancient DNA is extremely difficult because most bones from archaeological sites have been carelessly handled. Extensive contamination with modern human DNA can swamp the signal of what little ancient DNA may still survive. Hans-Jurgen Bandelt, a geneticist at the University of Hamburg, wrote that the DNA that had been recovered from the Etruscan bones showed clear signs of such problems. By 2007 a new set of genetic studies that was being reported seemed much more likely to lend greater credence to Herodotus' long-disputed account. New and independent sources of genetic data suggested that Etruscan culture was imported into Italy from somewhere in the Near East. One such study was based on the mitochondrial DNA of the residents of Murlo, a small former Etruscan town whose population may not have changed all that much since Etruscan times. When placed on a chart of mitochondrial lineages from Europe and the Near East, the people of Murlo mapped closest to Palestinians and Syrians, as reported by a team that was being led by Torroni and Alessandro Achilli in the April issue of The American Journal of Human Genetics. In Tuscany as a whole, the Torroni team found eleven minor mitochondrial DNA lineages that occurred nowhere else in Europe and were shared only with Near Eastern people. Another source of genetic data on Etruscan origins had been developed by Marco Pellecchia and Paolo Ajmone-Marsan at the Catholic University of the Sacred Heart in Piacenza. Tuscany has four ancient breeds of cattle. Analysing the mitochondrial DNA of these and seven other breeds of Italian cattle, Ajmone-Marsan found that the Tuscan breeds genetically resembled cattle of the Near East. The other Italian breeds were linked to northern Europe. It seemed clear that the Etruscans had come from the Near East, and like all good pastoralists they had brought their cattle with them. Text copyright © The New York Times. Reproduction is made on a 'fair dealing' basis for the purpose of disseminating relevant information to a specific audience. No breach of copyright is intended or inferred.